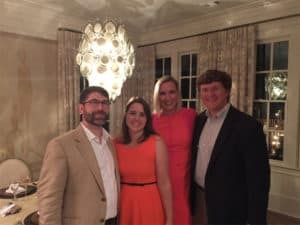 Spotlight on Atlanta Architect J.P. Curran with Curran and Co.
On Thursday evening, Andy and I had the great pleasure of attending Atlanta Homes and Lifestyles Premiere Party for the Serenbe Designer 2015 Showcase Home. Best yet… we were guests of our personal architect and friend, J.P. Curran, who was the architect of the gorgeous 2015 showhome. And, I should say that there are very few individuals that would make me want to drive through torrential downpours, flooded interstates, and Braves traffic with Andy Peters behind the wheel. (If you’ve seen Andy drive, you know what I’m talking about.) But, for me, J.P. Curran is one of those people! He created our very own dream home for us in Brookhaven 2 years ago! And, not a day goes by, that I’m not thankful for our home that he so artfully designed! You see, J.P. has a knack for listening. I’ll never forget the first time we met with him. He was so quiet and reserved. (I’m accustomed to real estate agents who talk non-stop!) J.P. listened! Like really listened. Andy and I walked out of that meeting thinking there would be many, many more to follow as J.P. learned more about what we were looking for. We were wrong. We opened the first drawings a couple of weeks later and were absolutely AMAZED at how he had captured the home we’d been dreming of but just couldn’t put into details or words! One of my biggest hang-ups with a home is when I drive by and can tell exactly what decade it was built! JP’s background from Historical Concepts has provided him with a background in traditional architecture and planning that will NEVER go out of style. And, I love that you’ll drive by my home 20 years from now and not realize it was built in 2014! If you are looking to build a new construction home in Atlanta, I cannot recommend J.P. Curran from Curran and Co enough! His homes are simply stunning. In fact, go check one out for yourself! Atlanta Homes and Lifestyles Serenbe 2015 Showhouse will be open through October 4th on Thursdays-Saturdays from 10-6 and Sundays from 12-6. For more information, visit www.serenbe.com. P.S. Our family thinks so highly of J.P. that our son, JM, wants to be an architect too! Check out his latest writing paper from school! ← Just Listed :: Beautiful Traditional in Canton's Wentworth!